Systems that help contain the spills of petroleum or other fuel from being released into the environment. 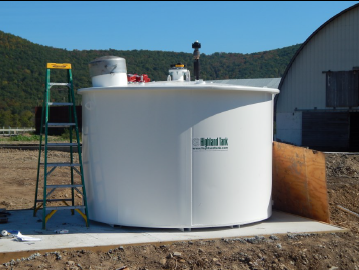 The SWCD was able to obtain New York State Agricultural Nonpoint Source funding and partner those funds with the USDA Natural Resource Conservation Service’s Environmental Quality Incentives Program funding to assist in cost-sharing a concrete manure storage, a milkhouse waste system, an access road, and petroleum spill containment in the form of a self contained petro-hopper on the Fleming Farm. Future work on the farm will include a covered barnyard project in 2016. (2) Self contained petro-hoppers were installed to replace old uncontained petroleum storages on a farm in the Town of Hector.